When installing Windows onto an already existing Windows, most of the old files are stuffed into a folder called windows.old which is placed on your newly formated C:\ drive. That folder contains the most important data from your previous installation, which is the Users folder as well as the Windows and Program Files folders. This way, you have an automatic backup of your files that you can get back to if you forget to backup yourself. Now there is one downside to this procedure: the folders that are backed up tend to get very large. They can take up several gigabyte of data, depending on how large your folders were. So if you don’t actually need that backup, why keep it? All of you who have ever tried to delete Windows system files will already see where this is going: part of the windows.old folders are old system files and Windows still recognizes them as those. But Windows actually has a neat little trick to delete them anyway! As you see it is 25 GB large on my machine which is a lot of space for files i don’t need anymore. That’s why, after we have double-checked if we really, really don’t need them, we check the box next to it and click on the OK button. 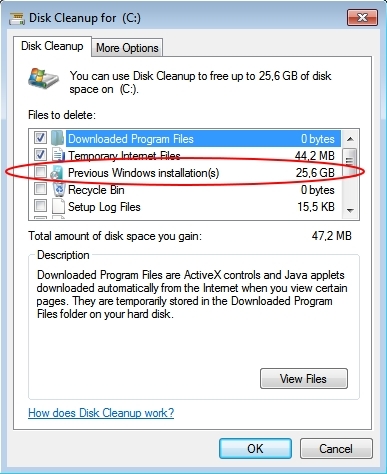 Confirm by clicking Delete Files on the next window and you are good to go with a whole lot of free space. I do not recommend this method, then the whole content will stay on the hard drive, but only a disguised form. 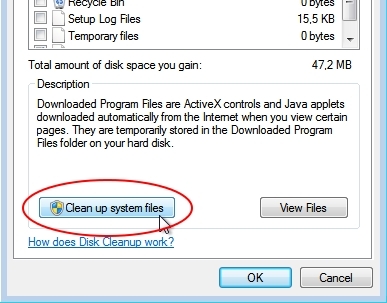 Much more sensible is to use CCleaner and before configure as shown in the picture. - Only You need to be logged in as an administrator! - You do not need a Professional or Business version, normal CCleaner fits perfectly. No i find the tip good from dalmatino , and i learn something new. In the past i had clean this folder always with unlocker also a quick and easy method to delete folders which are locked by system.